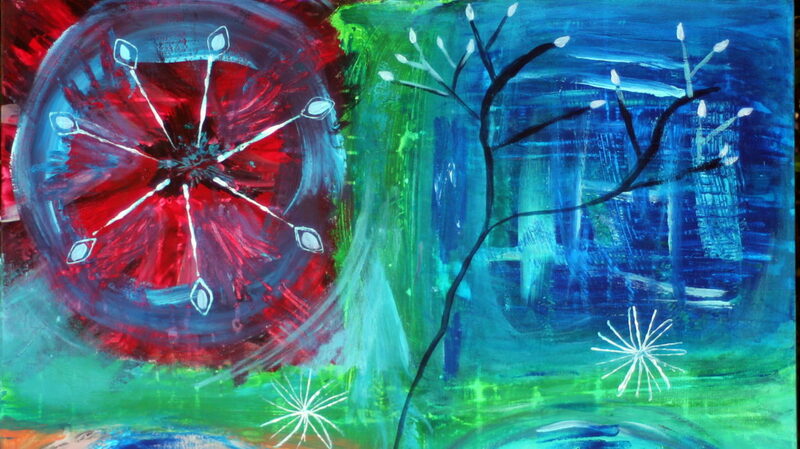 Hello, this site offers you now, an online art shop, at very advantageous art-studio prices. This allows you, if you are far from the studio, to be able to acquire a work of art in my collection of abstract painting online without moving. Of course all payments are secure. I can send you, if you need more photographies and other information, you really should not hesitate to ask me to go through the contact page. To create this art shop is for me the opportunity to share my art work, but also to allow you to acquire at an art piece at studio price, that is to say at very affordable prices, unique works of art original, without the apprehension of entering at a Gallery if you are not used to it. 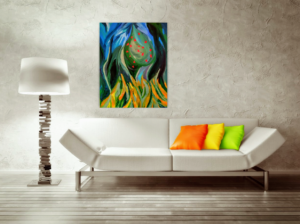 Do not hesitate after any purchase to send me a photography of your painting in place at your home. I will create a gallery with these pictures of my paintings living their lives in your interiors. Normally you will find the operation of this simple art shop is rather intuitive. When you click on the link Art shop there are several products that will display different tables and at that time you click on a table and each time I propose a picture of the entire table on which you can zoom to see each spare It but also an image of the picture in situation so you can realize what it gives to the scale in an interior. But if you want a picture of the painting to position it in a photo of your home or if you want several pictures of the details of the painting and well you can ask me and I will send them to you. 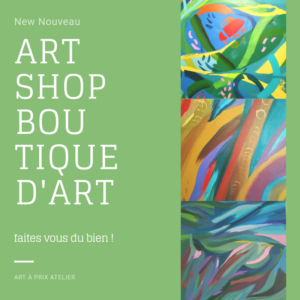 Moreover, with the art shop I also propose to be sure not to deceive you, to offer a painting via a gift voucher, available in the art shop, with a valid duration of 4 months, for the person who receives it! Then for the operation of the shop and well it is like for any purchase on the Internet you put your painting in a shopping cart and then all you have to do is to fill in your details and pay your purchase. As a result of which you will receive well packed, your painting, your work of art at your home, at the address you have indicated. That’s the easiest thing to do, isn’t it? For now really enjoy it because my works of art do not exceed the sum of €880 for the larger parts and it is really not expensive, but I want to favour the sale and the fact that they go elsewhere rather than cram them, or that sell them at prices that Sometimes I find it indecent. Having no certainty that it will last or not, it is better to enjoy it now. If you have any questions about my artistic approach, the operation of the art shop or any other question, please contact me. 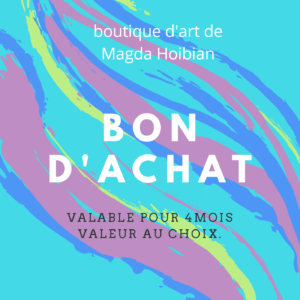 Well to you artistically your Magda Hoibian artist painter.